As snowdrifts pile up in North America, thoughts turn to the tropics. When winter-weary geologists look to trade their frostbites for suntans, few destinations are more appealing than the Dominican Republic. Known to regular visitors by its initials, the DR has much to entice travelers with an interest in the earth sciences. Located on the eastern two-thirds of Hispaniola, the DR is massive by Caribbean standards. (Only Cuba is bigger.) Hispaniola is the 22nd largest island on the planet, and the Dominicans share it with the impoverished nation of Haiti. 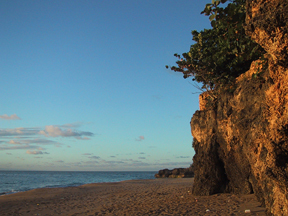 Playa Madama, a beach on the northern coast of the Dominican Republic, is accessible only by a jungle trail, and is usually deserted. All photos by Callan Bentley. Santo Domingo, the capital city, is the oldest European city in the New World. Founded by Christopher Columbus in 1496, Santo Domingo's "Zona Colonial" is the ideal neighborhood to start exploring the DR. Ancient blocks of weathered limestone form fortresses, museums and the Western Hemisphere's oldest cathedral. The pedestrian avenue El Conde traverses the colonial zone, and offers shops and cafes that cater to both Dominicans and tourists. At the eastern end of El Conde, the excellent Conde Peñalba restaurant offers shady outdoor seating, people-watching and cold drinks. Once refreshed, visitors can stroll next door to sample two of the DR's most celebrated exports: cigars and amber. Many of Cuba's premier tobacconists relocated after Castro's revolution, and now produce world-class stogies in the DR. They go especially well with local rum, another domestic specialty. The diversity of cigars available is matched only by the diversity of insects trapped in Dominican amber. 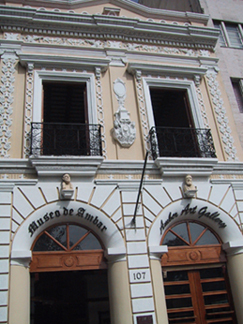 Santo Domingo is home to two amber museums, which showcase specimens of the fossilized tree sap in a dozen tints. Amber containing fossilized animals is considered the most valuable, and is certainly most interesting for those of a paleontological bent. In Jurassic Park, the amber that supplied the DNA (via mosquitoes) from which the dinosaurs were resurrected was said to have been mined in the DR. However, the oldest Dominican amber is a scant 25 million years old, far too young for its trapped mosquitoes to have sipped dinosaur blood as their last meal. The Dominican Republic has one of the world's richest deposits of amber. The fossilized tree resin is showcased in this musuem and several others in Santo Domingo. 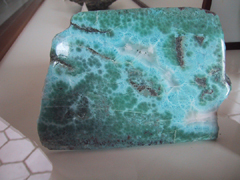 Displayed along with amber is a blue mineral unique to the DR: larimar. It comes from a single deposit located in 1974 by a U.S. Peace Corps Volunteer. Larimar is a pectolite mineral that derives its azure hue from copper inclusions. After a few days of exploring the bustling Santo Domingo, most visitors will be ready to head to a quiet beach. The Dominican Republic's serrated coast offers an almost countless number of sandy coves, lined in postcard-perfect coconut palms, and the north coast is especially nice. Transport throughout the country is inexpensive. Visitors can travel on a clean, air-conditioned bus from Santo Domingo to the north coast for only U.S.$7. This route traverses some hilly terrain: the Cordillera Central. The DR has the Caribbean's highest peak, Pico Duarte (elevation 10,416 feet or 3175 meters). Guided summit hikes may be arranged from nearby Jarabacoa, and take several days round-trip. The Cordillera Central is a low-pressure metamorphic belt that finds its partner in the high-pressure North Coast belt. All along the north coast of the DR are uplifted subduction zones, according to John Lewis, emeritus professor at George Washington University in Washington, D.C., who has conducted research in the DR since 1972. These are separated from the rest of the country by several large left-lateral strike-slip faults. Magnitude-4 temblors are common on these faults, occurring every few months on average. One fault rupture on Sept. 22, 2003, triggered a magnitude-6.5 earthquake that toppled buildings and caused several deaths in Puerto Plata. Larimar, a blue pectolite mineral, is found only in the Dominican Republic. A far more potent disaster arrived almost a year later, when Tropical Storm Jeanne hit Hispaniola. The storm struck on Sept. 15, 2004, with 80 mph winds, and moved slowly along the north coast, drenching both the DR and neighboring Haiti. Although the two countries have roughly comparable populations, Haitians dwell in half the land area. This concentrated population has denuded the landscape in its appetite for fuel and food, with the result that Haiti's slopes could not withstand the large amount of rain dumped by Jeanne. More than 1,500 Haitians died in Jeanne's flooding and landslides, while the more-forested DR saw only about 20 fatalities. The difference is sobering testament to the importance of intact forests. Despite these natural disasters, there is still much beauty in the DR, especially on the Samaná Peninsula, in the DR's northeast. A natural paradise unmatched in the rest of the country, Samaná Bay is the breeding ground of most Atlantic humpback whales. About 10,000 of the massive sea creatures mate and calve in the bay from January to March. 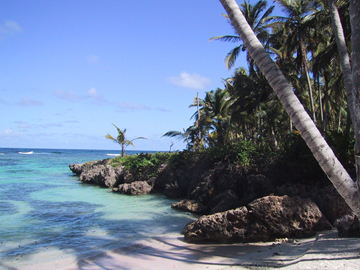 The Dominican Republic's coast offers both sheer limestone cliffs and wide sandy beaches. The whales have impeccable taste, and Samaná's waterfalls, forests and beaches offer endless opportunities for exploration by land-bound creatures, too. The limestone of the coasts is sculpted into cliffs, headlands and caves. A natural blowhole called La Boca del Diablo ("Mouth of the Devil") sends pressurized ocean water shooting high in the air. There and elsewhere, outcrops of limestone bear copious fossils of ancient reefs. Samaná offers the richest natural landscape in the DR.
Few experiences are finer for the adventurous traveler than a forested hike to an isolated beach like Playa Madama, near Las Galeras. After emerging sweaty from the jungle, you can swim in the turquoise waters of the cove, claim the best sunning spot on the beach, or practice your Robinson Crusoe skills by attempting to harvest coconuts by hand.